Hand arthritis is characterized by narrowing and inflammation of one or more of the joints in the hand. Arthritis leads to the loss of articular cartilage, which covers the ends of the bones and allows the bones to move smoothly against each other. When the cartilage is damaged, the bones rub together during joint motion and cause pain. This can lead to pain with motion, clicking, grinding and/or loss of grip strength. When arthritis becomes severe, the body attempts to stabilize the joint and limit motion by forming bone spurs or extra bone around the edges of that joint. The most common type of hand arthritis is thumb CMC (carpometacarpal) arthritis where the CMC joint between the thumb bone and the trapezium bone is affected. There are two main types of arthritis: rheumatoid and osteoarthritis. Rheumatoid arthritis occurs when the body's immune system causes inflammation in the joints. Osteoarthritis occurs when the joint surfaces wear down as a result of overuse, age, or prior injury. When an infection in the joint leads to loss of cartilage, it is called septic arthritis. Patients suffering from hand arthritis will experience pain, stiffness and/or loss of function and strength. A grinding, clicking or locking sensation may be felt in the affected joint. Loss of motion can become severe and the patient may have trouble performing everyday tasks, such as grasping objects and pinch strength. Arthritis is diagnosed by physical exam and X-ray. 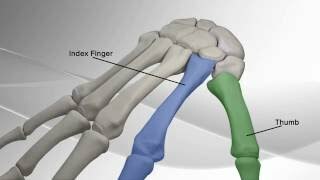 Your orthopedic surgeon will examine your hand, noting range of motion, strength and pain with motion. Your surgeon will obtain X-rays or MRI to evaluate for arthritis. Physical therapy can assist in treating thumb CMC (carpometacarpal) arthritis to strengthen soft tissues that support the joint. The stronger the supporting soft tissues, the less the body will need to rely on bony architecture to stabilize the joint. Therapy may lead to less stress on the arthritic joint. Because arthritis includes inflammation, your surgeon may prescribe anti-inflammatory medications or an injection to reduce the inflammation. For arthritis in its beginning stages, nutritional supplements may slow progression of the arthritis. When non-operative treatment has failed or the patient’s pain has progressed, your surgeon may suggest surgery. 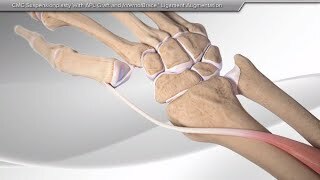 Thumb CMC arthritis is treated surgically by removing a portion of the trapezium bone or the entire bone to aid in relieving arthritis symptoms. 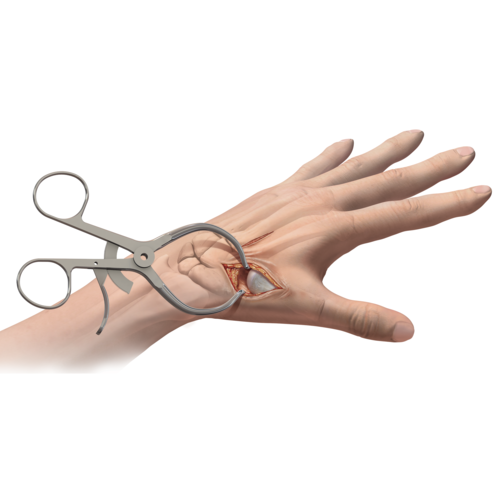 Patients will have either a suture device or a ligament in place to keep the thumb suspended in anatomical position after the trapezium bone is removed. This suspension prevents the thumb from moving too far out of normal positioning and keeps the patient’s range of motion and function near normal.